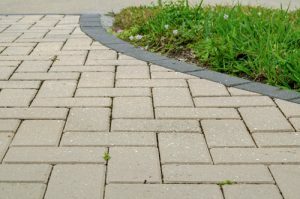 Homeowners looking to reinvigorate their driveways should consider investing in driveway pavers. Driveways that were once normal and boring can be transformed into mosaics of driveway paving stones. These stones come in a variety of shapes, sizes and colors. Some come in natural shades of grays and tans while other driveway paver stones resemble brick. The stones can even be arranged in patterns to create magnificent pieces of art. Some homeowners choose circular patterns while others choose waves or checkerboards. Others choose small stones so they can create more detailed images. With so many different stones to choose from, the possibilities are virtually endless. Every homeowner can find stones that fit the aesthetic of his or her property. Driveway paver stones can turn a plain driveway into the property’s centerpiece. Some homeowners choose to decorate their driveways to suit their own tastes while others use the paving stones to increase the values of their properties. Driveway pavers add elegance and class to any driveway. Because the stones can be arranged in virtually any pattern, every driveway that uses driveway pavers/bricks can be unique. There are many ways to make a home stand out, and spicing up the driveway is one of the most creative ways to do so. Because of driveway pavers/bricks, driveways do not have to be plain, gray and boring. Creative homeowners may choose to arrange the stones in circular patterns, diagonal patterns and even waves. Smaller stones can even be used to create elaborate images that suit the homeowner’s tastes. Driveways can become canvases with the help of a company that installs driveway pavers/bricks. The value of the property may even increase with the addition of an aesthetically pleasing driveway. These stones are also easy to clean, so practicality does not have to be sacrificed to have an attractive driveway. Improving a property’s aesthetic can be as easy as adding driveway paving stones. These stones come in a variety of different colors and shapes. Some stones come in natural colors like gray and tan while others resemble brick. Because driveway paving stones have so much variation, there is guaranteed to be something for every homeowner. Homeowners who simply want a better-looking driveway might choose a simple pattern while others treat their driveways like canvases and choose elaborate patterns. The most common patterns for driveway pavers/paving stones are diagonal patterns, circular patterns and wave patterns. Smaller stones make it possible to create more detailed images like those found on mosaics. Brick driveways add elegance and class to any home. Because the bricks can be arranged in virtually any pattern, every driveway can be unique. There are many ways to make a home stand out, and spicing up the driveway is one of the most creative ways to do so. Driveway paving bricks are not just installed in the plain traditional pattern. Creative homeowners may choose to have their brick driveways installed in a circular pattern, diagonal pattern and even waves. Your driveway can become a canvas with the help of our company to consult and install your driveway pavers and bricks. The value of your property may even increase with the addition of an aesthetically pleasing driveway. These bricks and pavers are also easy to clean, so practicality does not have to be sacrificed to have an attractive driveway. Call Boulder Falls today to schedule a free no-obligation consultation!